class="post-template-default single single-post postid-332769 single-format-standard custom-background group-blog header-image full-width singular wpb-js-composer js-comp-ver-5.7 vc_responsive"
SEWARD, Neb. – Head coach Ben Boldt and members of the Concordia University volleyball team will admit they’re not perfect, but the results have been so far in 2018. The Bulldogs rode out a few bumps in the road on Friday night (Aug. 31), but ultimately brushed aside visiting Bethany College (Kan.), 25-20, 25-14, 25-17, in the final match of day one at the Bulldog Bash. 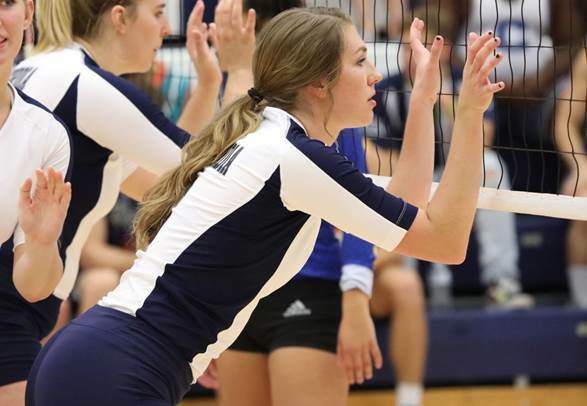 Boldt and the program are hosting four other volleyball squads this weekend, including three from the state of Kansas and one from North Dakota. Concordia has checked the first of three boxes in the event and is now 6-0 without a set loss in the early going this season. “They have good outsides and a really good setter,” Boldt said of Bethany. “Any time you go up against that, you’re going to be in a match. Their serve tonight gave us some fits. Boldt singled out the team’s passing as a weakness in this particular match, but no one could fault the effort of sophomore Marissa Hoerman in the back row. She piled up a career high 27 digs while helping limit the Swedes (0-7) to a .124 hitting percentage and only 28 kills. Harlie Himmelberg also helped clean up with 12 digs on an evening when the Bulldogs mustered just a pair of blocks. Hoerman will be a key figure all season for Concordia. Her tenacity will especially come in handy when the Bulldogs go up against the GPAC’s heavy hitters. On the attacking side of things, the Bulldogs have proven to be satisfied with spreading the ball around. Setters Tara Callahan (17 assists) and Kaci Hohenthaner (19 assists, nine digs, three aces) set the middle a lot on Friday. Emmie Noyd pounded a match high 11 kills on 27 swings. Other nice contributions were made by Jenna Habegger (eight kills, .286), Alex La Plant (8 kills) and Kelsey Baarck (six kills, .357). The Bulldogs hit .264 with 44 kills on the night. Their attack got more efficient as the night wore on with their hitting percentages going from .217 to .278 to .308 from set to set. Junior Lauren Cope chipped in with a kill in the second set before having to depart with an injury. Sophomore Kara Stark also saw action. She swatted three kills on her six attempts. The Bulldog Bash will continue on Saturday with Concordia taking on Valley City State University (N.D.) at 11 a.m. and then Benedictine College (Kan.) at 5 p.m.